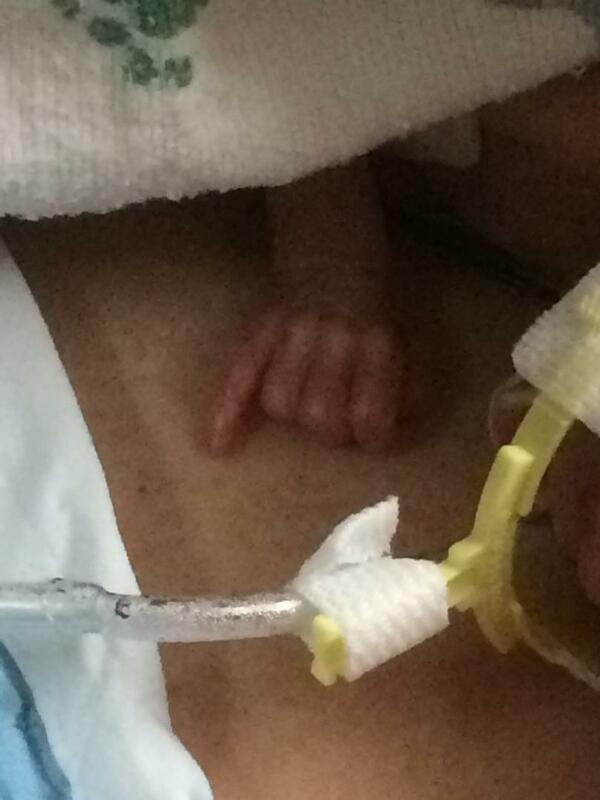 As noted below, Jenny is the Proud Mother of Winston Jeffries, a Micro Preemie (born by Emergency C Section due to complications, at 1.1 lb, on October 25th). Mother Jenny will be spending the next 100+ days with Winston at the St Cloud Hospital NICU (Neonatal Intensive Care Unit). Winston will be there and be monitored by caring and loving hands until it is safe for him to go home. While this goes on, Jenny, an Entrepreneur, will not be able to support her family as she has in the past. 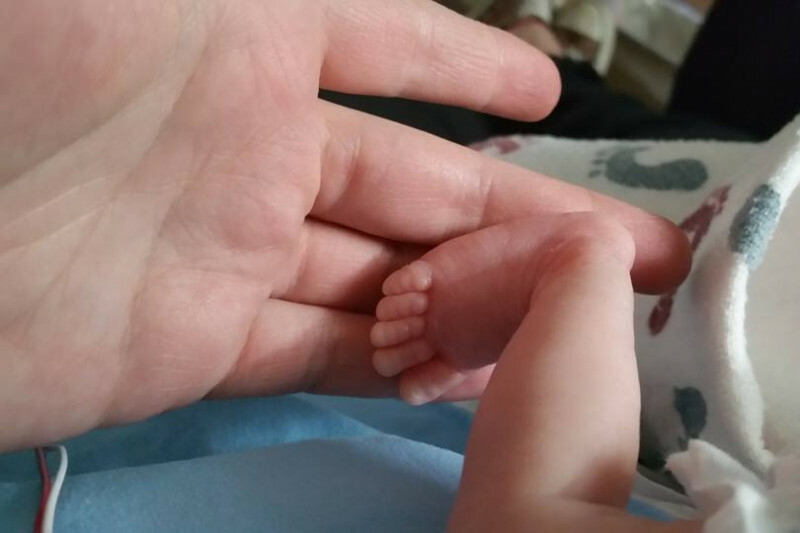 She is a go-getter and can fend for herself, but while needing to spend up to 10 hours in NICU with Winston and with homr being 30 miles from the hospital, she will likely be financially strapped. She will be staying at the Gorecki Guest House, across from the hospital for convenience, but home bills will still need to be paid. During this time Winston and Jenny will need funds for transportation, food, and bill paying. Jenny has a modest need, but we have no idea what kind of medical bills may be experienced or how she will be able to pay for these services. Jenny needs to be focused on her health and on being there for Winston. That is the most important thing in their lives right now. The financial issues that she is faced with need to be met in some way. Check in on Winston and Jenny at Caring Bridge: "Winston Jeffries". We will be updating this Caring Bridge site as things progress. 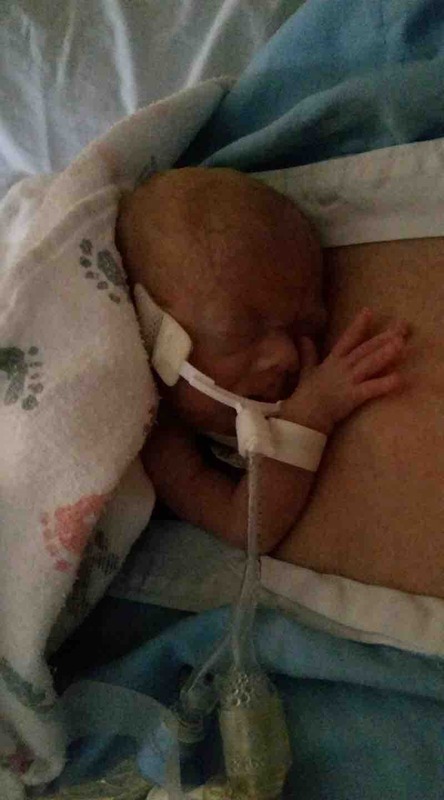 Winston Jeffries was born on October 25, 2017 at 11:00 A.M. by an emergency c section at 25 weeks of gestation, weighing 1.1 lb. Due to Jenny having a high risk pregnancy already, doctors were concerned when her blood pressure increases could not be managed. She had not been feeling well for several weeks and was in and out of both the clinic and the emergency rooms. On Monday October 23, her OBGYN took one look at her blood platelet levels and sent her directly to the hospital. A normal blood platelet level is around 150,000 to 450,000, Jenny's was just hovering over 14,000. Needless to say she was very sick and was diagnosed with severe Preeclampsia with dominating HELLP (Hemolysis, Elevated liver enzymes, and a Low Platelet count) syndrome. It is a life threatening pregnancy complication and if left untreated can cause death to either mom, baby or both. Her medical team consisted of High Risk OBGYN, Hematologist, Internal Medicine, Rheumatologist, Perinatologist, and several others. 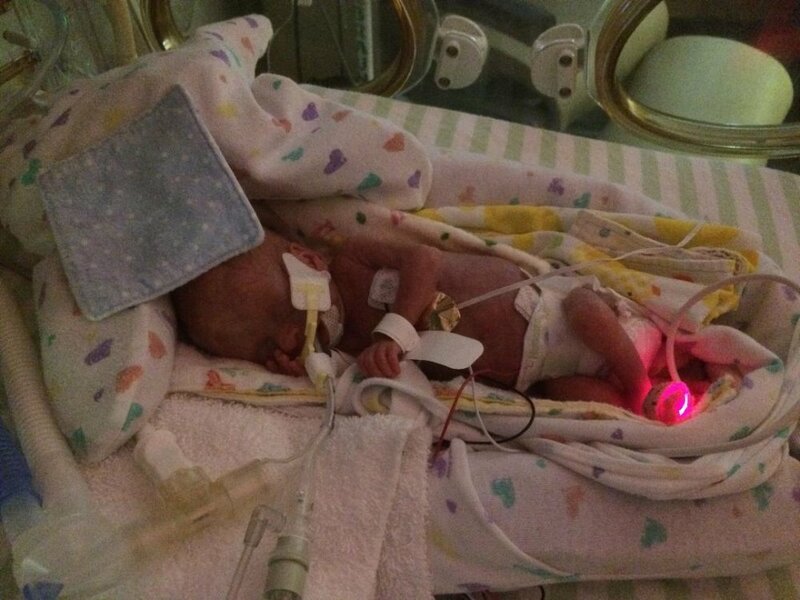 The goal for the next 48 hours was to stabilize Jenny's condition, get steriod injections going to help the baby's lungs develop, magnesium, blood platelet infusions to up her level, a blood transfusion and to monitor baby's heartbeat. For the next 41 hours, Jenny's received 24/7 nursing and PCA care. It was decided that they could not wait until the full 48 hours and ended up taking him by an emergency c section. At 11 A.M. we welcomed Winston Jeffries to the world, Jenny's first miracle baby. 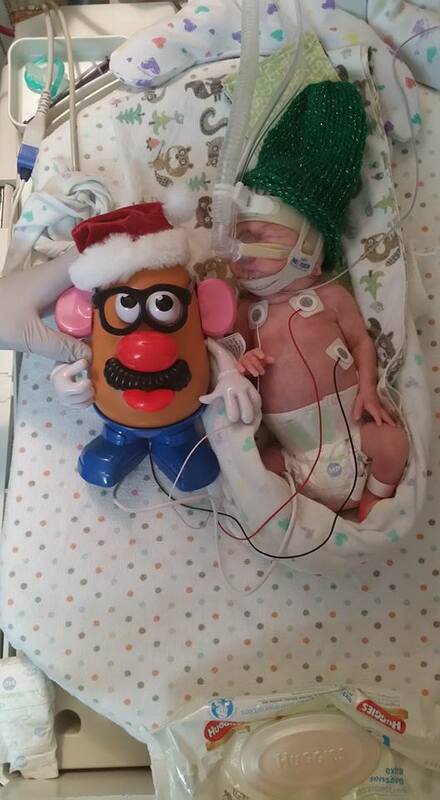 Winston was put on a ventilator and admitted to the NICU immediately after delivery. He is in critical condition, yet stable from time to time. He has needed several platelet transfusions and a blood transfusion. His brain MRI scans (for inter cranial bleeding) are clear. 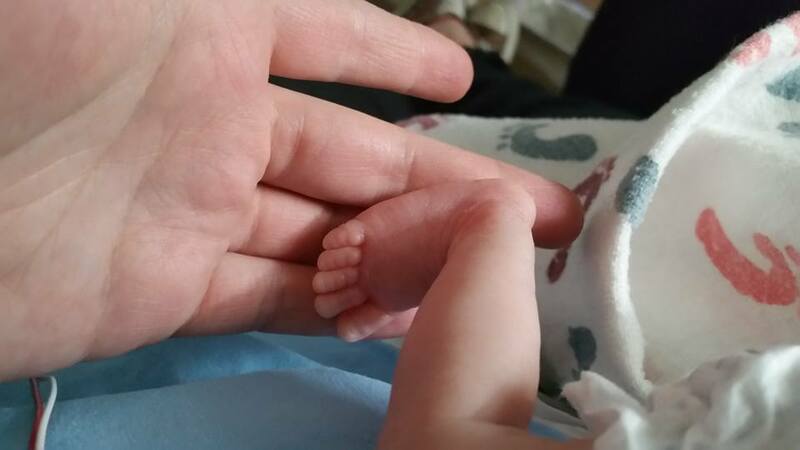 Here are some of the really cool things they do in the NICU to encourage mommy and baby bonding: Jenny is encouraged to reach in for some gentle touch bonding with him, she swabs his mouth out with her own pumped breast milk, and does diaper changes. Jenny places a cotton cloth with her scent in with him and his scent is shared with her. They have a harpist playing the harp outside of his room on certain days of the week. Kangaroo care will be part of the next steps. There are nurses with him all day, everyday, his blood sugars and gasses are checked and monitored hourly. His diaper is about the size of a woman's thumb. 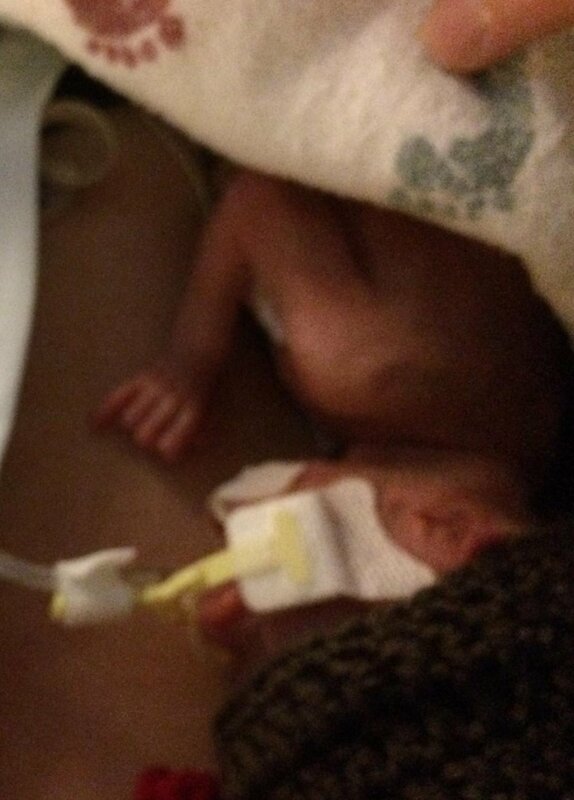 At the time of writing this story, Winston is 9 days old or almost 27 weeks. 11/06/2017 Update - Day 12 Winston has had some struggles in the past 24 hours. From Jenny's FB Post: Update!! There will be many.....some good, some bad. Winston had a rough night, he forgets to breathe at times and his blood sugars are out of whack, so no holding today and they will start an insulin drip to help control his sugars. 11/19/2017 Update - Day 25 of Winston's Life we went to visit. Papa Phil, G-Ma Jeanne, and G-Ma JoJo got to visit Winston, Jenny, and Tom. Mama was Kangarooing with Winston. We got to see him up close and personal. Winston had a tough night last night. 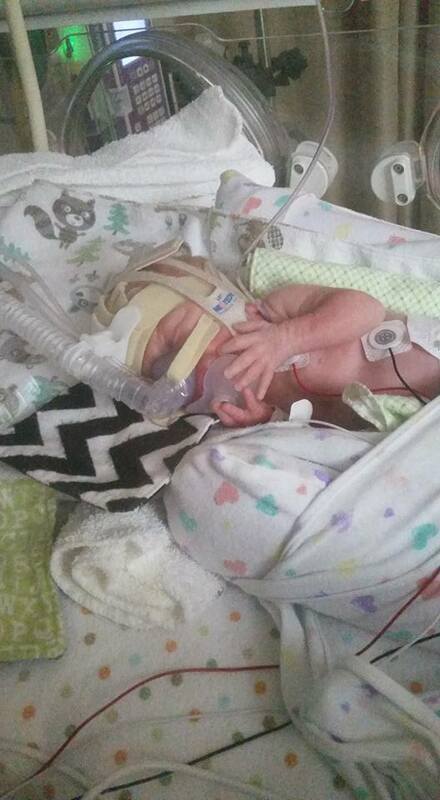 He stopped breathing three times and was resuscitated each time. They intubated him and put in the breathing tube. He was stable today. Resting peacefully. The NICU doctors and nurses are fabulous! They do such a wonderful job! Prayers are needed and welcome. 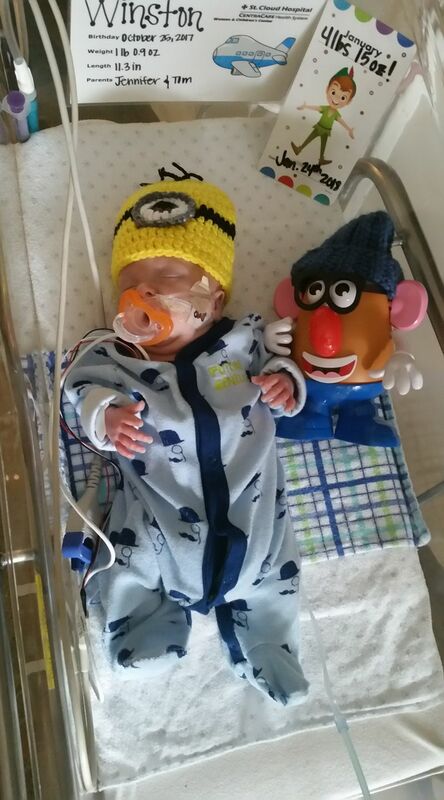 Help Us Support Jenny and Tom While Their Attention is Driected Toward Little Winston! Share this with your friends and family. Winston's family continues to need your help. Thanks for all of your continuing support. Jenny posted this video today! It’s Awesome! Kangaroo Care for Winston with Mommy.